As you guys know, I'm in the process of moving house (..STILL!) and I've been on the lookout for cute home accessories for a while. As much as I love Homesense, Dunelm etc - I do like to have some handmade goodies in there as well. Ornamental Owl sells a variety of different crafty bits - but I was drawn to her personalised wooden baby brushes. Not to actually use, but to use for decorative purposes. There's also adult brushes available if you'd like to buy one to actually use. 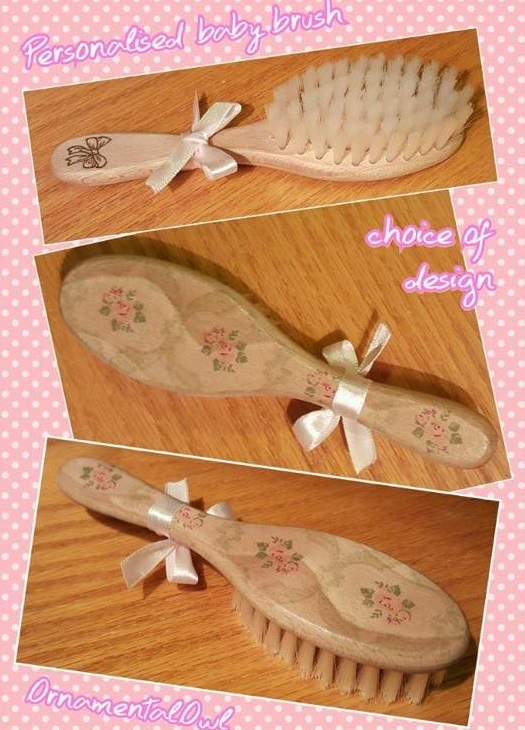 Firstly, I was asked to choose my preference of decoupage design for the back of the brush - so I chose a lovely floral Cath Kidston-esque design. Instead of a name, I asked for a bow to be engraved on the handle and a little bow to be tied to the handle. When it'd been made - I was sent a picture of it to make sure that I was happy with it and then the store owner let me know when it had been shipped. There was about a week turnaround which is super impressive for a custom order! As you can see, my brush is absolutely precious - it will look lovely on display on one of my shelves in my house. Or perhaps in the bathroom! Either way, I can't wait to have it on show as it's beautiful and the quality feels great too. Remember to check out Ornamental Owl!